The number of Ethiopian farmers using modern beekeeping technologies introduced by the International Centre of Insect Physiology (icipe), has increased eight-fold over the past seven years, from just 120 in 2011 to 900 by end of 2017. Significantly, more than one third of these farmers are women, in a country where beekeeping is traditionally considered a male-only occupation. icipe’s beekeeping activities in Ethiopia are supported by the European Union (EU), Biovision Foundation for Ecological Development, Switzerland, and the Mastercard Foundation. In June 2018, representatives of the European Union Delegation to Ethiopia including: Dominique Davoux, Team Leader, Rural Transformation & Resilience; Erik Habers, Head of Cooperation and Eshetu Mulatu, Operations Officer, visited icipe-led beekeeping sites in Tolay, Oromia region. The Delegation also visited Holeta Bee Research Centre, which serves as a satellite station of the EU funded African Reference Laboratory for Bee Health, based at the icipe headquarters in Nairobi. The Delegation was accompanied by His Excellency Dr Gebregziabher Gebreyohannes, State Minister, Ministry of Agriculture and Livestock Resources, Ethiopia, and an icipe team led by the Director General, Dr Segenet Kelemu, and colleagues from the Centre’s Ethiopia Country Office. 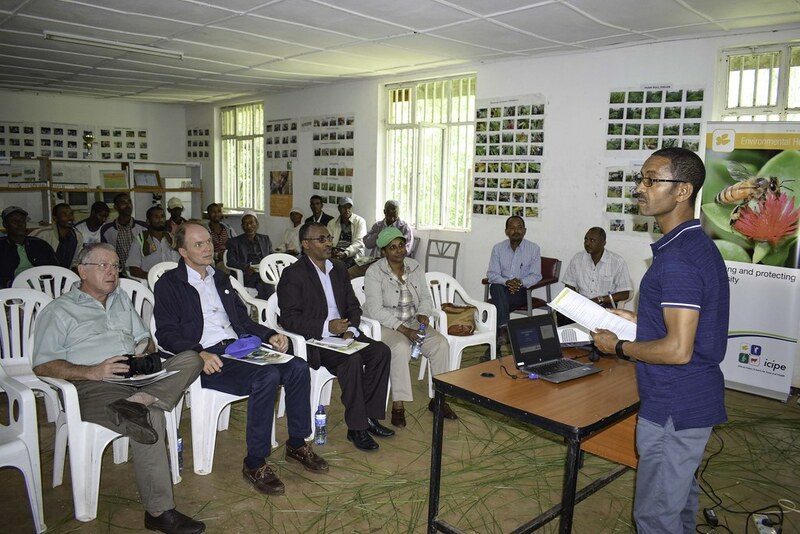 The aim of the visit was to observe progress and achievements in scaling-out improved beekeeping, on-going research activities and effects on developmental issues, and to contemplate strategies to strengthen collaboration and to enhance the beekeeping value chain in Ethiopia. The itinerary included tours of apiaries and nursery sites, laboratory facilities, and discussions with farmers, beekeepers and local and national partners, including representatives from Ethiopian Apiculture Board, Ethiopian Honey and Beeswax Producers and Exporters Association, and Ethiopian Conformity Assessment Enterprise. In partnership with various donors and collaborators, icipe continues to implement a range of initiatives in Ethiopia across the Centre’s 4H Theme: Human Health, Animal Health, Plant Health, and Environmental Health.